An animated documentary, by its very nature, makes self-evident its own mode of production. More openly than live-action documentaries (though not without exception), documentaries that make use of animation in the bulk of their presentation like Waltz with Bashir (2008) and Chicago 10: Speak Your Peace (2007) signal to their viewers the artificial constructedness of their production. It flies against the most widely held (though ultimately quite dubious) claim that documentary film has the artistic and moral imperative to present that which is factual and actual. In Tower, the latest documentary from Keith Maitland (which opens October 12), audiences are confronted with animated images of the country’s earliest mass shooting on a college campus. The day is August 1, 1966 and the University of Texas in Austin is having a quiet if uneventful morning. A young boy is delivering papers on a bicycle with his cousin. A cop is relaxing with one of his colleagues. A pregnant college girl is walking with her boyfriend down the school’s main thoroughfare. That is, until an unidentified person begins shooting from the school’s clock tower. This led to a 90-minute standoff during which a total of 18 people died and more than 30 were wounded before the shooter was killed by a police officer. Tower shows us this almost in real time, with Maitland putting us squarely at the center of the action as we follow a number of the people who lived through this bloody day. 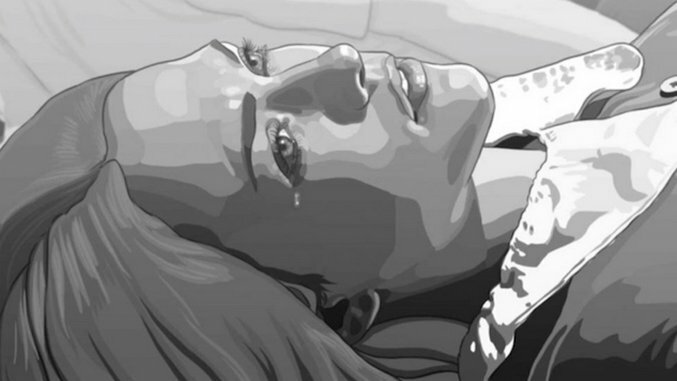 The images are in grayscale, with some color accents, rendered using rotoscoping so that what we’re watching looks like an accurate (lifelike, even) facsimile of the events during that hot late summer day but with enough of a stylistic distance that the subject matter and its attendant violent images have a discomforting effect. Throughout, Maitland (A Song for You: The Austin City Limits Story) and his animators shuttle back and forth between archival footage (mostly of the tower from where the shooter perched himself) and a series of reenactments of people’s memories of that day. This allows Tower to depict scenes that would, one imagines, be either too painful or exploitative to watch had they been filmed: When the pregnant girl and her boyfriend get shot, we see no splashes of red blood, just a shattering of the animated image, abstraction taking the place of the literal. Sheila Sofian, in an in-depth feature on animated documentaries, posits this as this increasingly burgeoning genre’s greatest strength: “I believe,” she writes, “that the use of iconographic images impact the viewer in a way in which live-action cannot. The images are personal and ‘friendly.’ We are willing to receive animated images without putting up any barriers, opening ourselves up for a powerful and potentially emotional experience. The simplicity of the images relieves some of the harshness of the topic being described.” It’s no surprise that documentarians who have gravitated toward using animation in their nonfiction projects have often done so when dealing with particularly icky if not outright gory subject matter. In her short film The Velvet Tigress, Jen Sachs tells the story of the murder trial of Winnie Ruth Judd in the 1930s (including graphic imagery of the body parts she disposed of), while in Penny Lane’s Nuts! (the “mostly true” story of Dr. John Romulus Brinkley, the kooky genius who built an empire out of his goat-testicle impotence cure), animation allowed the filmmakers to depict some of the more ridiculous and altogether R-rated elements of Brinkley’s life story. What might otherwise be too graphic or even merely gratuitous within the realm of live action becomes palatable (engaging, even) when filtered through an animated lens. This goes right back to the genre’s beginnings. Winsor McCay’s The Sinking of the Lusitania (1918), for example, credited to be the first such documentary, begins with explanatory intertitles that relay to the audience how it is that the short film was created, as if needing to further demystify what they were about to see. “Winsor McCay, originator and inventor of Animated Cartoons,” its first one reads, “decides to draw a historical record of the crime that shocked Humanity.” We’re then shown McCay and his animators at work before we get to see what the film terms “the first record of the sinking of the Lusitania,” the British ocean liner sunk by a German U-boat in 1915. The need for these prefatory images and intertitles were no doubt intended to explain to contemporary audiences how it is that such a recreation was possible. Cinema, still then a nascent form (and one increasingly tied to newsreels and premised on the veracity of what it was showing), used animation here as a stand-in for those scenes it could never have hoped to record but also in a way that captured the immensity of the loss while keeping it rather abstract. McCay’s short film depicts the boat sinking alongside details from the wreck, privileging animated wide shots of the ship; the moment when he zeroes in on those aboard the ship is presented in a still frame. The animation hopes to bring us close to the tragedy while keeping us at a necessary remove. Close to a century later, Tower mobilizes these very same ideas to present a wholly wrenching depiction of how the community at U of Texas responded to the havoc the lone shooter wreaked. But what’s curious about Tower is how much further it goes in using animation as a tool to tell this particular story. Rather than offer what could easily be a mere history lesson on the shooting, or a timely piece on gun violence (see: Michael Moore’s use of animation in Bowling for Columbine), Tower aims instead for a visceral retelling of those tense 90 minutes in Austin. The rotoscoped frames (think A Scanner Darkly) give the appearance of a live-action film devoid of color and texture. But rather than distance us from the reenactments at hand, they actually incite a sense of urgency. This is because the talking heads that disrupt these action set pieces (for that is what they are, with students running from the shooter; cops riding in to secure the area; an anchor broadcasting live from the scene from his car) look exactly like the ones we see in the scenes before us, as if their interviews with the filmmakers had happened immediately after their ordeal. Their voices even are reflective of the people in front of us: The young boy delivering the paper who was shot while riding his bicycle sounds like a young Mexican teenager. As we learn in the latter part of the film, this is because Maitland’s actors—those who reenacted the scenes that would later be rotoscoped—also re-recorded the testimonials that sketch and explain what it is we’re watching. It’s a surprise move in that, just as with McCay’s explanatory intertitles, reminds us of the many layers of artifice that exist between what happened and what we’re being shown, which is, nevertheless, intended to exist as a vivid document of that fateful day. While animation served a clearly pragmatic end (as Maitland has discussed in interviews, it allowed him and his team to show scenes at the campus without needing to actually shoot there), it also served a stylistic one. As he told Film School Rejects, “The animated image, and the black and white palette that we used, reflects the fuzzy nature of 50-year-old memories and it leaves plenty of room for audiences to fill in the blanks and complete the picture on their own, in ways that standard recreation does not.” This echoes what Richard Robbins, who crafted an animated sequence in his Oscar-nominated documentary, Operation Homecoming: Writing the Wartime Experience (2007), told writer Beige Luciano-Adams in the latter’s piece “When Docs Get Graphic: Animation Meets Actuality”: “On a more aesthetic level, there’s a way in which more literal representations of certain things are less powerful than abstract ones because we’ve become so immune. If you start showing real footage of real violence, people in pain, then people stop listening. It impinges on your ability to listen to the story.” That’s one thing you can’t really fault in Tower. The sequences are so harrowing and so well choreographed that they demand your attention, and having flattened the style of the film—where talking heads, reenactments and various commentators exist within the same visual key—there’s never a time when you’re yanked out of the story at hand. Tower poses new questions about what animation can do within a nonfiction film, not only complicating generic distinctions but reminding us of the potential of animated images to do more than entertain our children at the multiplex.